So another year of this “move the clocks ahead nonsense” is behind us. Another Spring when people showed up for church, golf and airplane flights late. But, because they now serve breakfast all day long, nobody misses the 11am McDonald’s Breakfast/Lunch cutoff any more. Whyyyyyyyyyyyyyyyy do we put ourselves through this??? So why are we worried about saving daylight? Some say it’s the government and an energy thing, some say it’s a Farmer’s Almanac thing and, quite honestly, most people have no idea and make stuff up!!! If you’re working at 2am, or 3am or, 3am that JUST WAS 2am 10-seconds ago, you may have just been shafted outta an hour worth of pay. And then there’s the changing-the-Microwave-Oven-WorkWatch-DressWatch-CarClock-OtherCarClockThatNeedsAPenToStockInTheThingy-TheVariousBatteryOperatedDecorativeWallCocks-TheShowerRadioClock-and-the-BedsideClockRadio routine. EXHAUSTING! SIDE NOTE: It absolutely KILLS me when the Microwave clock and the Oven clock don’t match minutes! And the dog, he’ doesn’t realize that his stomach-alarm needs to be changed by an hour… he’s HUNGRY NOW!!!! 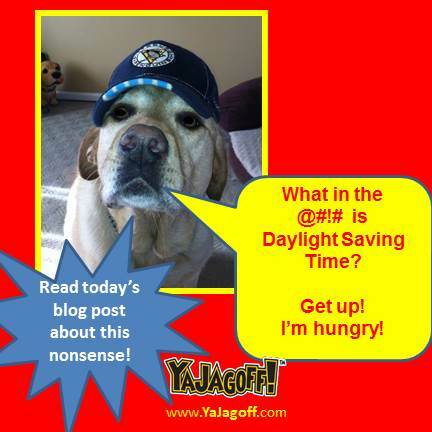 And how about the work-time lost due to DST… we know about the March Madness mess of people wasting time at work but how many work-hours are lost by people standing around the office last Friday searching the internet and arguing over the “Is it spring FORWARD?” question! My vote, let’s just keep the clocks the same all year around and, those of you who WANT that precious extra hour of daylight, get your lazy arses out of bed an hour early on your own, Ya Jagoffs!! !